Increases physical strength, dexterity and endurance – Mechanical oscillations create stretch reflexes in your tendons thereby stimulating involuntary muscle contractions throughout your body via your nervous and musculo-skeletal system. These repeated oscillations stimulate repeated contractions, like repetitions of a weight exercise at the gym, resulting in increased muscle strength and work tolerance. WBV provides enhanced power training to principle muscle groups in less time. 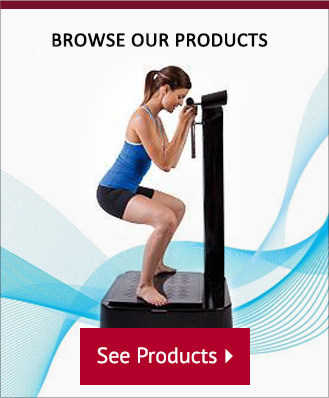 Improves balance and coordination – The moving plate stimulates stretch receptors and tendon reflexes in your joints. This stimulates increased receptor activity in a safe environment, challenging your balance and coordination systems. Increases bone density – Can reverse the effects of osteoporosis by increasing the mechanical stressors on the bones via the involuntary muscle contractions created by the machine as well as balancing the hormones within the body. Reduces joint pain & inflammation while reducing ligamentous stress – The vertical movement creates a stretching in the joints, increasing space and replacing fluid between the bones as well as stimulating a dramatic increase of critical blood flow to these areas. It is especially good for spinal tightness. WBV improves mobility and flexibility of your joints and relieves stress to joints, ligaments and tendons while releasing tension throughout your body. Improved pelvic floor function – Pelvic floor instability usually results from softening of connective tissue during pregnancy. Vibrational therapy quickly brings the hormonal system into balance, enabling connective tissue to recover its strength and firmness. Speeds recovery from surgery or trauma – the improved blood and lymph circulation created by WBV speed up healing time by the body. The serotonin release decreases emotional trauma effect by the patient and HGH release aids in body recovery as well. By increasing the overall Chi of the body, WBV stimulates a more efficient rate of recovery starting at the cellular level of the body. WBV also prevents loss of muscular strength from surgery due to lack of exercise during the initial recovery period. Increased circulation of blood & improvement of cardiovascular system – Blood vessels are located between muscles that “pump” the blood throughout your body. WBV create muscle contractions, which in turn promote blood flow through to the next area, increasing cardiac output and overall circulation. This is great for people who are either inactive, starting to get active, have circulation problems etc. Scientists are comparing it to a full hour of cardiovascular workout. Nervous System – WBV stimulates your nervous system’s proprioceptors, triggering your muscles and joints to remind you of where you are in space. Sort of like a work out for your nerve receptors. Muscle contraction is an all or nothing nervous response to stimulus so there you have it, instant nervous system stimulation. I have personally seen the TSVS affect those with paraplegia by stimulating those muscles that their brain is unable to find, thereby minimizing lower body atrophy in spinal chord patients. Increased lymph drainage & detoxification of systems – The lymphatic system is connected to every organ in the body and is absolutely essential in purifying the body to strengthen the entire immune system. Many consider the proper lymphatic drainage to be even more important than blood circulation. These fluids, however, require the pumping actions of movement and exercise, which is often severely limited in today’s sedentary society of increased toxins and poor nutrition. Vibration therapy stimulates lymph drainage to promote detoxification and strengthening of the immune system. As mentioned above, the lymph system is a primary way to dispose of toxins and keep our body healthy. Inactivity as well as over bombardment of toxins leads to stagnation of the Lymph system. The TSVS stimulates the lymph system to improve the rate at which toxins are disposed from our body, thus accelerating your body’s healing response. New cells are more resilient, vibrant, and function together more cohesively as a healthier, longer lasting body. Relieves menopausal symptoms – improved body efficiency and improvement of hormonal systems effects those at any age, especially those needing increased hormonal balance during body-life transitions. Improved mood and energy level – Increased secretion of serotonin, a hormone used in many anti- depressants, is released into the body. When you increase the number of optimal functioning cells, this promotes improved strength, stamina, coordination, mental clarity, as well as vitality and overall well-being. Users of WBV have also experienced accelerated recovery from injuries and disappearance of chronic symptoms. Decreases Body Fat – WBV works several ways to dissolve excess body fat; it increases metabolism which burns calories more rapidly; increases blood circulation and lymphatic drainage thereby removing toxins faster. Human Growth Hormone secretion increases dramatically (460%). Excess body fat melts away effortlessly. People who use the WBV for 10 minutes, three times a week, lose significantly more fat than those who engage in aerobic activity for one hour three times a week! Without sweating, bad body odor or even make-up smudging, the WBV 10 minute session is the equivalent of a 40-90 minute workout. The old fat deposits that have been stagnantly sitting in areas (you know where they are) are stimulated for use by the body again, thereby promoting fat metabolism and decreased body fat. 3 of the 8 modes of the TSVS are geared towards body fat reduction. Overall Tightening – Call it a natural face-lift. Your skin, being the largest organ in our body, is also stimulated to tighten up and become more elastic with vibrational therapy. Noticeable is the dissolving of cellulite areas and tightening of the facial muscles. Decreases Stress levels – Daily life is stressful, causing the release of toxic stress hormones such as cortisol and epinephrine. These chemicals through the immune system out of balance as well as destroy brain cells by the millions. The WBV increases human growth hormone and seratonin secretion, thereby lowering cortisol and epinephrine secretion up to 31%. This plus the increased circulatory effects of the WBV positively counteract the effects of stress on the body as well as the spirit. To understand how WBVworks on a cellular level, we need to remember the age old truth that everything has a natural vibration – from the ground we walk on – to the air we breath – to the water we drink – everything is vibrating. The cells in our body, likewise, have their own optimal individual vibrations as well. Liver cells vibrate different then heart cells, which vibrate at a different rate then brain cells, etc. All of these vibrations go to make up our particular frequency. Good health is nothing more then our cells, and subsequently our energetic systems, vibrating at the rate they were designed to vibrate and in harmony with each other. WBV is a great passive way to create a more active cellular body. This extremely safe device is helpful to: the elderly; weak and fragile population & overly obese who don’t have enough strength to do the cardio they need or have balance issues that prevent long walks on uneven surfaces; those with a sedentary lifestyle; those too busy to find time to exercise; patients in rehabilitation and athletes looking for that extra edge. Everyone can benefit from this comprehensive exercise system that is now available to the masses.